For other uses, see peseta (disambiguation). The peseta (/pəˈseɪtə/, Spanish: [peˈseta])[a] was the currency of Spain between 1868 and 2002. Along with the French franc, it was also a de facto currency used in Andorra (which had no national currency with legal tender). The name of the currency comes from pesseta, the diminutive form of the word peça, which is a Catalan word that means piece or fraction. The first non-official coins which contained the word "peseta" were made in 1808 in Barcelona. Traditionally, there was never a single symbol or special character for the Spanish peseta. Common abbreviations were "Pt", "Pta", "Pts" and "Ptas", sometimes using superior letters: "Ptas". Common earlier Spanish models of mechanical typewriters had the expression "Pts" on a single type head, as a shorthand intended to fill a single type space (Pts) in tables instead of three (P+t+s). Later, Spanish models of IBM electric typewriters also included the same type in its repertoire. When the first IBM PC was designed in 1980, it included a "peseta symbol" "Pts" in the ROM of the Monochrome Display Adapter (MDA) and Color Graphics Adapter (CGA) video output cards' hardware, with the code number 158. This original character set chart later became the MS-DOS code page 437. Some spreadsheet software for PC under MS-DOS, as Lotus 1-2-3, employed this character as the peseta symbol in their Spanish editions. Subsequent international MS-DOS code pages, like code page 850 and others, deprecated this character in favour of some other national characters. In order to guarantee the interchange with previous encodings such as code page 437, the international standard Unicode includes this character as U+20A7 PESETA SIGN in its Currency Symbols block. Other than that, the use of the "peseta symbol" standalone is extremely rare, and has been outdated since the adoption of the euro in Spain. In the version 1.0 of Unicode the character ₧ U+20A7 PESETA SIGN had two reference glyphs: a "Pts" ligature glyph as in IBM code page 437 and an erroneous P with stroke. In Unicode 2.0 the reference glyph P with stroke was erroneously displayed as the only symbol for peseta and was latter corrected to the Pts ligature and a separate character code was added for the peso sign. The peseta was subdivided into 100 céntimos or, informally, 4 reales. The last coin of any value under one peseta was a 50-céntimo coin issued in 1980 to celebrate Spain's hosting of the 1982 FIFA World Cup. The last 25-céntimo coin (or real) was dated 1959, the ten céntimos also dated 1959; both coins bore the portrait of Franco. The 1-céntimo coin was last minted in 1913 and featured King Alfonso XIII. The ​1⁄2-céntimo coin was last minted in 1868 and featured Queen Isabel II. The peseta was introduced in 1868, at a time when Spain was considering joining the Latin Monetary Union (LMU). It replaced the old Spanish peso currency. Spain eventually decided not to formally join the LMU, although it did achieve alignment with the bloc. The Spanish Law of June 26, 1864 decreed that in preparation for joining the Latin Monetary Union (set up in 1865), the peseta became a subdivision of the peso with 1 peso duro = 5 pesetas. The peseta replaced the escudo at a rate of 5 pesetas = 1 peso duro = 2 escudos. At least 1252–1284 there was a 1 obolo brass coin – plated with silver – stamped. Colnect shows even a first 1 Maravedí-coin made of copper having been edited since 1454. The bigger silver coin 1 Real came out 1786. The latter two currency units were used until the Peseta came in 1868. Note: From 1868 to 1982, a unique dating system for Spanish coins was employed. This would be adopted and sometimes abandoned intermittently during various times, and continued through to be used through the first years of the Juan Carlos I reign. Although a common "authorization date" will be found on virtually all coins of this period on the obverse (front) of each coin, the actual date for many coins can be found inside a small six pointed star, typically on the reverse (back) of each coin, but sometimes the front. Therefore, the obverse date does not always reflect the actual date of mintage but rather a restriking off of older obverse coin die designs. So, if the coin date shows 1959 up front but a tiny "64" is depicted in the six pointed star on the back, then the actual date of issue is in fact 1964 rather than the date depicted in front. This dating system would be abandoned in the early 1980s anticipating a one by one redesign of each coin denomination. No coins were issued by the short lived First Republic (1873–1874). In 1869 and 1870, coins were introduced in denominations of 1, 2, 5, 10, 20 and 50 céntimos, and 1, 2 and 5 pesetas. The lowest four denominations were struck in copper (replaced by bronze from 1877), with the 20, 50 céntimos, 1 and 2 pesetas struck in .835 silver and the 5 pesetas struck in .900 silver. 5 and 10 céntimos coins were quickly nicknamed as perra chica (small dog) and perra gorda (fat dog) respectively, as people then were unable to recognize the shape of the lion in them, mistaking it for a dog. The 5-peseta coin was nicknamed duro (hard). 5-peseta coins were called duros by every generation until the withdrawal of the peseta in 2002, and Spaniards would often informally account in that unit (e.g. using '20 duros' for 100 pesetas). Gold 25-peseta coins were introduced in 1876, followed by 10 pesetas in 1878. In 1889, 20-peseta coins were introduced, with production of the 25 pesetas ceasing. In 1897, a single issue of gold 100 pesetas was made. Production of gold coins ceased in 1904, followed by that of silver coins in 1910. The last bronze coins were issued in 1912. Starting in 1906 a new series of 1- and 2-céntimo coins were issued in bronze. Due to a number of economic issues these were the only two coins from this series. Coin production resumed in 1925 with the introduction of cupro-nickel 25 céntimos. In 1926, a final issue of silver 50 céntimos was made, followed by the introduction of a holed version of the 25 céntimos in 1927. In 1934, the Second Spanish Republic issued its first coins in the denomination of 25 and 50 céntimos and 1 peseta. The 25 céntimos and silver 1 peseta were the same size and composition as the earlier Royal issues, whilst the 50 céntimos was struck in copper. In 1937 a 5-céntimo coin was struck in iron and a new 1 peseta in brass. An iron 10-céntimo coin was also produced in 1938 but never issued into circulation, unknown whether due to its close resemblance to the 5 céntimos or because the government of issue fell before it could be released. All of these replaced symbols and images related to the monarchy. The brass 1 peseta was sometimes nicknamed La Rubia (The Blonde), as it issued a woman's face in a golden-colored alloy. The Nationalists issued their first official coins in 1937. These were holed 25 céntimos featuring a rising sun and a clutch of arrows. These coins were minted in Vienna. A smaller copper 25 céntimos followed in 1938. Following the end of the Civil War in 1939, the victorious Nationalist government introduced aluminium 5 and 10 céntimos in 1940 featuring a conquistador, followed by reduced size aluminium-bronze 1-peseta coins in 1944 featuring the state crest and national symbols. The first 1-peseta coins bearing the portrait of Francisco Franco were issued in 1947. Cupro-nickel 5 pesetas followed in 1949. In 1949, holed cupro-nickel 50 céntimos were introduced, followed by aluminium-bronze ​2 1⁄2 pesetas in 1954, cupro-nickel 25 and 50 pesetas in 1958 and smaller aluminium 10 and 25 céntimos in 1959. Silver 100 pesetas were issued between 1966 and 1969, with aluminium 50 céntimos introduced in 1967. In 1966 Franco's profile was redesigned to depict a more current representation of the leader. Following the accession of King Juan Carlos, there were a few changes. The replacement of Franco's portrait with that of Juan Carlos on the 50 céntimos and 1 peseta in 1975 and the addition of a cupro-nickel 100 pesetas in 1976. 10 céntimos were discontinued. However, more significant changes occurred to each coin in 1982. Following this redesign the 50 céntimos was discontinued, with aluminium replacing aluminum-bronze in the 1 peseta. A 2 pesetas coin was also introduced featuring a map of Spain, though this denomination never became popular. More importantly, nickel brass 100 pesetas were introduced. The redesign centered around the 1982 World Cup and depicted football (soccer) related themes on the 1, 5, 25, 50, and 100 pesetas. Shortly afterwords, the large cupro-nickel 100 pesetas by a smaller aluminim-bronze coin, which also replaced the 100 pesetas banknote. cupro-nickel 10 pesetas was introduced in 1983, a denomination that had previously not been issued for many decades. This preceded a wholesale redesign in all circulating Spanish coins and abandonment of the "star" dating system. Cupro-nickel 200 pesetas were introduced in 1986, followed by aluminium-bronze 500 pesetas in 1987. In 1989 the biggest changes came; the size of the 1-peseta coin was significantly reduced, however not discontinued (making it the smallest, lightest circulating coin in Western Europe and perhaps the world at that time). The 2-peseta coin was discontinued. Smaller aluminum-bronze 5 pesetas were introduced, and reduced aluminium-bronze 25 pesetas were also introduced which had a hole in the center. Smaller 50 peseta coins were also issued the same year in cupro-nickel with the distinct Spanish flower shape that would eventually be used by many countries, most notably the 20-cent coin of the euro. At the same time, the 200-peseta coin was made larger and included an identifiable edge with incuse lettering. In 1999, a laser-etched hologram was added to the 500-peseta coin as a security feature to help discourage counterfeiting. During this period, all coins except the 1 and 500 pesetas went through a commemorative redesign each year, in a similar vein to the U.S. State commemorative quarters program until their discontinuation in 2001 preceding the introduction of the euro common currency. The 50-peseta coins issued between 1990 and 2000 were the first that featured the Spanish flower shape. Like all member nations, these coins come in denominations of 1, 2, and 5 cents in copper plated brass, 10, 20, and 50 cents in Nordic gold, and bimetallic 1 and 2 euros with a common reverse design. The obverse of the first three denominations feature Cathedral of Santiago de Compostela, the 10, 20, and 50 cents depict Spanish poet-writer Miguel de Cervantes, and the 1 and 2 euros depict the effigy of King Juan Carlos I or King Felipe VI. In 1874, the Bank of Spain (Banco de España in Spanish) introduced notes for 25, 50, 100, 500 and 1,000 pesetas. Except for the 250-peseta notes only issued in 1878, the denominations produced by the Central Bank of Spain did not change until the Civil War, when both the Republicans and Nationalists issued Bank of Spain notes. In 1936, the Republicans issued 5 and 10 pesetas notes. The Ministry of Finance (Ministerio de Hacienda) introduced notes for 50 céntimos, 1 and 2 pesetas in 1938, as well as issuing stamp money (consisting of postage or revenue stamps affixed to cardboard disks) in denominations of 5, 10, 15, 20, 25, 30, 40, 45, 50 and 60 céntimos. The first Nationalist Bank of Spain issues were made in 1936, in denominations of 5, 10, 25, 50, 100, 500 and 1,000 pesetas. 1- and 2-peseta notes were added in 1937. From the mid-1940s, denominations issued were 1, 5, 25, 50, 100, 500 and 1,000 pesetas. 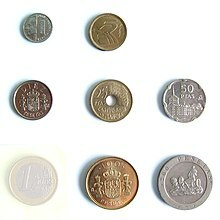 The 1, 5, 25 and 50 pesetas were all replaced by coins by the late 1950s. In 1978, 5,000-peseta notes were introduced. The 100-peseta note was replaced by a coin in 1982, with 1,000-peseta notes introduced in 1983, 200 pesetas in 1984 and 10,000 pesetas in 1987. The 200- and 500-peseta notes were replaced by coins in 1986 and 1987. The final series of banknotes were introduced between 1982 and 1987 and remained legal tender until the introduction of the Euro. The Andorran peseta (ADP) (pesseta in Catalan) was pegged at 1:1 to the Spanish peseta. Following the outbreak of the Spanish Civil War on 17 July 1936, the Consell General de les Valls d'Andorra issued Decree No. 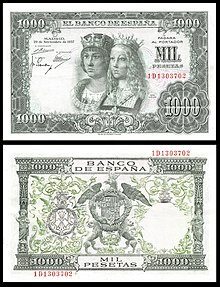 112 of 19 December 1936, authorizing the issuance of paper money backed by Spanish banknotes. The peseta was replaced by the euro (€) in 1999 on currency exchange boards. Euro coins and notes were introduced in January 2002, and on 1 March 2002 the peseta lost its legal tender status in Spain, and also in Andorra. The conversion rate was 1 euro = 166.386 ESP. Peseta notes issued since 1939 and coins that were legal tender on 31 December 2001 remain exchangeable at any branch of the Spanish Central Bank until 31 December 2020. According to that entity, as of March 2011 pesetas to a value estimated at 1.7 billion euros had not been converted to euro. ^ 1999 by law (on financial markets and business transactions only), two currency units used (the Spanish peseta still had legal tender on all banknotes, coins and personal bank accounts) until 2002. ^ Brendan D. Brown (1979). The Dollar-Mark Axis: On Currency Power. Springer. p. 79. ^ Stichwort Peseta, in: Diccionario Etimológico español en línea. Santiago de Chile 2016,2019. ^ Sato, Takayuki K. (2000-01-06). "Peso sign and Peseta sign (U-20A7)" (PDF). Retrieved 2015-12-26. ^ 1 céntimo (1911-1913). World Coin Gallery. ^ 1/2 céntimo (1866-1868). World Coin Gallery. ^ Charles P. Kindleberger (2005). A Financial History of Western Europe. Taylor & Francis. p. 150. ^ "A Point of View: Making friends the shared currency way". BBC News. 2 March 2012. ^ "Euro becomes a reality". BBC News. 1 January 2002. ^ "E-Day: The euro is born". BBC News. 1 January 1999. ^ Coins > Spain > Series > 1230–1516 – Spanish United Kingdom Castile and León Colnect, retrieved 9 November 2016. ^ Jabalquinto School. Regional Government of Andalusia. ^ Ten years without the Peseta, Muy Interesante magazine. ^ Ajuntament de Santa Coloma de Queralt. "Una mica d'història". Retrieved 25 April 2013. ^ Linzmayer, Owen (20 January 2012). "Andorra". The Banknote Book (1 ed.). San Francisco, CA. p. 10. Retrieved 2012-04-27. ^ Peseta Exchanges. Archived 2014-02-21 at the Wayback Machine Banco de España (Bank of Spain). ^ Rainsford, Sarah (March 5, 2011). "Spain town reintroduces peseta to boost economy". BBC News. Retrieved March 5, 2011. Wikimedia Commons has media related to Spanish currency.